Realistic graphics – Screen space is not wasted on cartoonish, non-useful graphics, like glowing tables. Graphics that are useful, cards, shoes and discard trays, are realistic, casino-style graphics. For example, there are 228 photo-realistic images of regulation discard trays and shoes merged into a felt table. Playing Strategies – The following strategies are included: Basic Strategy, High-Low, Halves, KO, Omega II, AOII, Red7, Zen, Hi-Opt I, Hi-Opt II, REKO, FELT, KISS-I, KISS-II, KISS-III, Spanish 21, Superfun 21, Expert, Silver Fox, and UBZ2. (Revere and Uston also available on request.) Complete index tables for each with modifications for common rules are included from the various books with authorization of the respective authors. CV products are the only software products authorized to include most of these strategies. Unusual strategy deviations are supported, like: Hit with 4 or more cards or any 678 possible, or Surrender 10,6 only. If you are counting cards, you can set which indices are used. You can also import strategies created with Casino Verite Windows software. Card counters can also detail how they calculate true counts. Betting Strategies – Card counters can also define a betting strategy. Warnings will be issued when violated. Casino Database – A database of U.S. and Canadian casinos included with 1,800 rule sets. You can search the database and load rules into the game. The Table – One, two, four and six seat tables are allowed in landscape mode. One or two seats in portrait mode. (Phones only support portrait mode for the table). 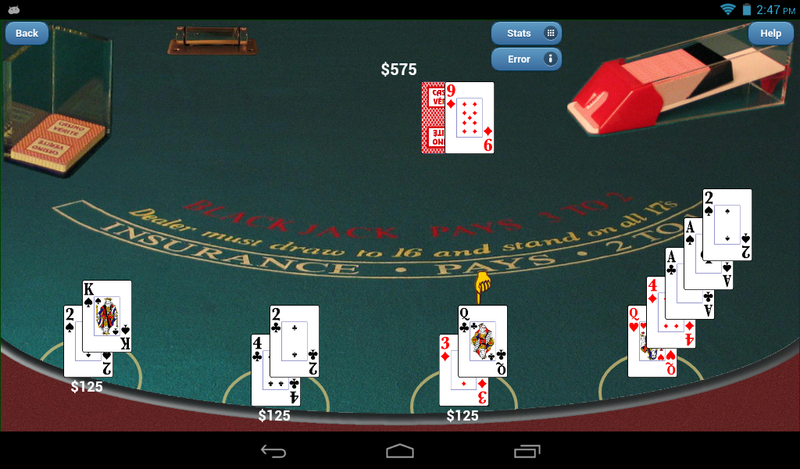 Landscape mode is a more accurate casino representation, while portrait mode provides larger graphics. You can play one to six seats at once. You can also reserve any seats for computer players. You can also set computer players to randomly enter and leave the game, as they would in a casino. Each seat supports splits of up to four hands with all hands displayed at once. Speeds – Dealer, computer player and payoff speeds can be changed independently. Gestures – All decisions can be made with gestures or by tapping buttons. Standard Options – You can set number of decks, shuffling after a certain number of cards or rounds, burn cards, the 18 common variations of doubling, insurance, surrender, cards dealt face up or down, European rules (no hole card), dealer hits or stands on soft 17, split to up to four hands, and table limits. More variations – More unusual rules like double on three cards, double on any number of cards, redouble, triple down, hit after double, double down rescue, resplit aces, multiple draw after ace split, dealer wins ties, player 22 counts as 21, 5, 6 and 7 card Charlie are supported. Bonuses – Seventeen unusual bonuses and Blackjack variations are also included. Dealer actions – The dealer can be optionally set to peak under tens, peek under aces, show burn cards, point out stupid plays, and make obvious plays without signaling. Unusual games – The number of variations to Blackjack has expanded greatly over the last several years as the ever-increasing number of casinos compete for customers. Some of these games have unusual rules and some have side bets. The following unusual games are included: Spanish 21, SuperFun 21, Over/Under 13, Royal Match, Lucky Ladies, 21+3, Big Slick, Bonanza Blackjack, Dare any Pair, Field of Gold, High Tie Bonus, Lucky Lucky, Match the Dealer, Red/Black, Pair Square, Perfect Pairs, Super 7s, and Sweet 16. Custom games – You can also create and import custom games created with Casino Verite Blackjack Windows software, and share such games if you wish. Blackjack Switch - This is a substantially different game that allows you to play two hands and exchange cards between the hands. Double Exposure - An additional very different game that allows you to see both dealer cards. The playing strategy is very different. A playing strategy is included thanks to Mike Shackleford, the Wizard of Odds. Your play will be checked by this strategy. Dealer errors – This is another attempt at casino realism and is important, particularly in newer casinos. Players tend to trust the dealer. If you do not catch dealer errors you may lose a significant portion of your edge. When set, on occasion the dealer will make an error. The amount is not wrong (except when Blackjack payoff errors is set). However, sometimes the dealer will not pay on a close winning hand, will not pay Insurance, will bust an un-busted hand, will bust your many card 21, will stand on a many card 16 or not bust himself on a many-card 22 or will not pay a bonus or side bet. You are tested to catch these errors. Biases – Drills are very useful for practicing one aspect of BJ at a time. The game is good for practicing all aspects at once. The problem is that random play does not present you with difficult situations very often. Most of your time is wasted playing easy hands. The point of these options is to make better use of your practice time. You can set one of five types of biases, like increasing the times hands that you have incorrectly played in the past will appear. Hole-carding - This advanced method of play is used when you happen to get a peek at the dealer downcard. The strategies are more difficult as you know both cards. A strategy is included by which your play is tested. Peeking at other player cards - In face-down games, seeing the other player's cards can improve results for Blackjack card counters. These features control how often you see these cards. Unbalanced Truecounts – Advanced users can truecount unbalanced strategies, like KO. The REKO-T strategy is included as an example. Side counts – Advanced players can side count tens for insurance decisions and aces for betting. Statistics – Statistics are kept, errors logs are kept, and error counts are kept by hand. Realistic graphics – Screen space is not wasted on cartoonish, non-useful graphics. Graphics that are useful, cards and discard trays, are large, realistic, casino-style graphics. For example, there are 206 photo-realistic images of discard trays. Flexibility – Tens of thousands of combinations of options are included. Nearly all screens operate in landscape or portrait. Optimizing your time – Hands are not thrown at you completely randomly. More difficult hands are presented more often. You can be drilled on five-card hands, which are substantially more difficult than two-card hands. For counting practice, the shoe can be biased toward a positive or negative count to increase difficulty. You can program it to throw cards out in different orientation, placement and numbers. It will remember errors you have made and present you with those hands. Speeds can be increased beyond the speed of human dealers. These features are designed to make better use of your time. Strategies – The following strategies are included: Basic Strategy, High-Low, Halves, KO, Omega II, AOII, Red7, Zen, Hi-Opt I, Hi-Opt II, REKO, FELT, KISS-I, KISS-II, KISS-III, Spanish 21, Superfun 21, Expert, Silver Fox, and UBZ2. Complete index tables for each with modifications for common rules are included from the various books with authorization of the respective authors. CV products are the only software products authorized to include most of these strategies. You can also easily import user strategies from Casino Verite Blackjack. Unusual strategy deviations are supported, like: Hit with 4 or more cards or any 678 possible, or Surrender 10,6 only. The Android versions are available directly from this site or GooglePlay (Games, Drills). For now, I will be distributing the Apple software myself to avoid their policies that slow down updates, just as CV products have been distributed for two decades. The prices are $14 for the drills and $35 for the games. There is no need to root your device. These are standard installs. To order, go to www.qfit.com/orders.htm and scroll down to Mobile Items. Make certain you include your e-mail as you will receive install instructions via e-mail.